Phyllis Luch, 1969, for song "I Often Go Walking"
Yesterday, my mom got the above art on a Mother's Day card I made for her. Now I can post this for all the other women, living and passed, that I love so dearly. This is a beautiful piece of art. 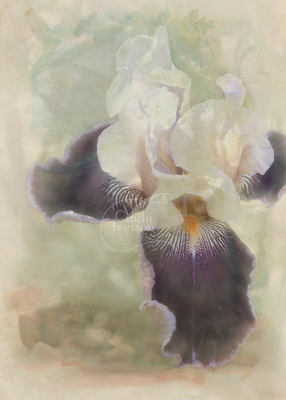 I just love iris! Very nicely done. Really awesome. The flower looks wonderful. How lovely ... a stunning card! This is my favorite yet! Simply beautiful! And the words of the poem go so perfectly with your artwork. What a beautiful card that must have made for your mom! I enjoyed that lovely poem you posted too. What a lovely picture and sentiments.